That said, nearly all of my past volunteer placements have included a change that required some flexibility, simply because anything can happen to cause a program to shift gears and reassign you to something else. So, while on a brief layover on my grueling string of flights to Kathmandu, I wasn’t exactly surprised to see an email from my volunteer organization informing me of a change in plans. In this particular case, the monastery in Pokhara to which I was originally assigned had an outbreak of swine flu that forced it to temporarily close its doors to volunteers. 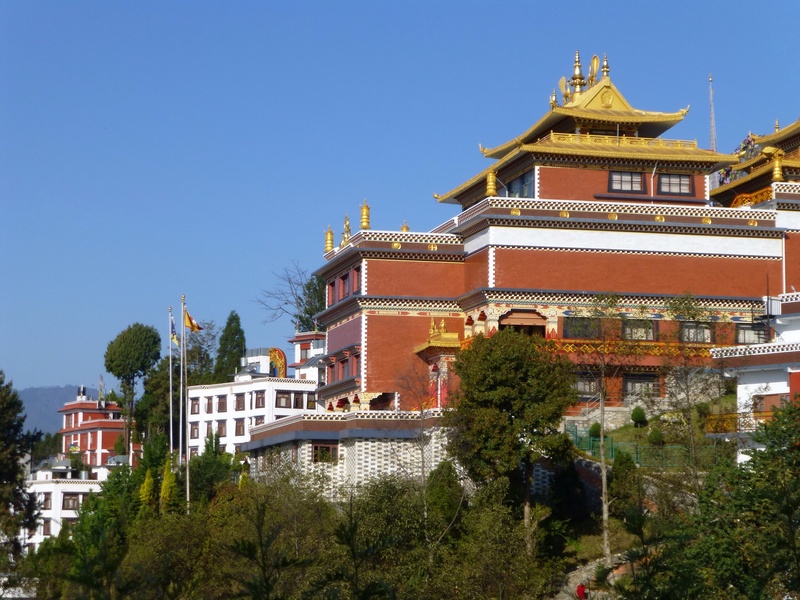 As a result, I was reassigned to the Thrangu Tashi Yangtse Monastery (TTYM) in Dhulikhel, which is a small town (pop. 9800) about 15 miles south of Kathmandu. I confess that I was wary of this change because a) I really wanted to spend time in Pokhara and b) I didn’t want to be too rural (being at a monastery is already potentially isolating—I didn’t want to exacerbate that by being too far from both civilization and reliable forms of communication). However, I warmed to the idea after I Googled the monastery and discovered that not only is it an important place of Buddhist pilgrimage, but it’s also the high point of one of the loveliest day hikes in Nepal. So here I am at the monastery, which is even more remote than I thought. Fifteen miles from Kathmandu doesn’t sound like much, but in a developing country, a single mile is equivalent to 10 due to the lack of roads, resources, and infrastructure to connect people and towns (case in point: it took us over two hours to traverse those piddly 15 miles). Given that the monastery is several miles above Dhulikhel and only accessible via one extremely bumpy unpaved road, I would call that “remote.” Sure, there’s a bus that comes up here several times a day, but lemmetellya: I saw that bus on my way up and the locals are cheek-to-jowl in that sardine can—so much so that they’re even riding upon its roof (so you get the proper visual, perhaps this is a good time to remind you of that bumpy road that makes the vehicle jostle and sway). The idea of taking that bus at any time during my stay does not appeal. This is what hiking shoes are for. My apologies—that was a pretty major digression, especially since it’s not a reflection of how I feel about being at the monastery itself. TTYM, which is also known as Namo Buddha, is a relatively new monastery (built in 2008) that is perched upon a hill at the sacred site of the Namo Buddha stupa, which was built to commemorate the place where Buddha—in one of his earlier incarnations—encountered a tigress that was dying from starvation and could not feed her cubs. In an act of compassion, Buddha sacrificed himself to be eaten so that the tigress and her cubs could survive, an act that automatically elevated him to the higher levels of existence. 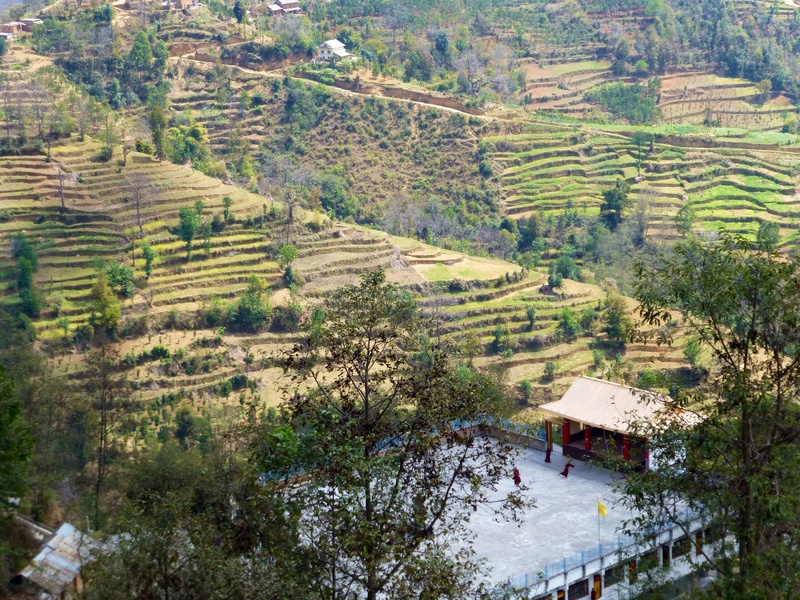 The monastery overlooks the green-terraced farmland below, all with a backdrop of the Himalayas in the distance. In other words, while it certainly is remote, it is also incredibly breathtaking. Gone is the dust and the cacophonous noise of Kathmandu, replaced by fresh air, the joyful sounds of nature, and the raucous noise of a lot of laughing, talking, chanting young monks. I’ve rambled quite a bit here, so I will explain more about the monastery and its inhabitants in future posts. For now, suffice it to say that I’m at Namo Buddha, have already “hit the ground running” teaching classes, and I’m continuing to go with the flow and perfecting the fine art of squat toilets, cold showers, and the simple life. A side note about photos: The “simple life” also means little-to-no Internet access. They have wi-fi, but it isn’t consistent or powerful enough to load photos. As a result, I will be slow about posting photos.